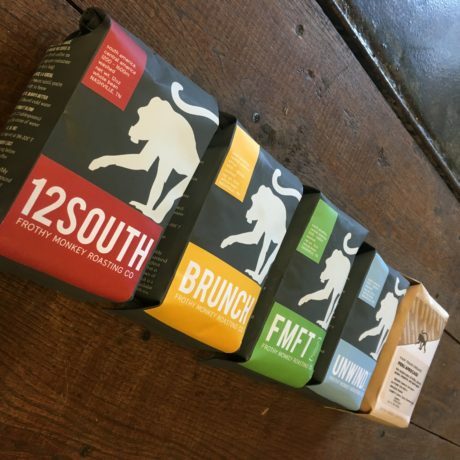 12South Blend, is our signature espresso blend which also makes great drip coffee, is sweet throughout, with balanced acidity, smooth body, and a caramel chocolate finish. Unlike coffee blends, Single Origin Coffee has a single geographic origin. This could be a single farm or a single country. For the majority of these coffees we will have a direct relationship with the farmer who grows it. Because coffee is a crop, harvesting is seasonal and the timing is specific to each region, our selection of single origin coffees will vary throughout the year. To make it extra special, we commissioned local artist, Alicia Binkley of Monkey Ink Design to illustrate our Single Origin labels. DESCRIPTION: This is an insanely smooth, balanced coffee, with notes of caramel apples, figs, and cashews throughout. It’s acidity is subtly citrusy, just like a clementine, and it’s sweetness is like strawberry candy.